Dubai’s lifestyle has been the epitome of luxury and style for its residents. Dubai has been a leading commercial and trading hub in the Middle East. Dubai has also diverted its attention towards developing its region as a tourist hub with its one of the most outstanding real estate project called the Dubailand. This outstanding property offers real estate, entertainment, hospitality, leisure and retail sector. Dubailand comprises of more than 200 leisure, tourism and entertainment projects. This project aims at attracting huge number of tourists and cater to all age groups, activities and nationalities. Real Estate Dubai is setting up milestones that will take a long time to achieve for other property markets from around the world. This entertainment complex project is owned by Tatweer, which is a division of Dubai Holding. The Dubailand construction has been segregated in four phases and is expected to finish the construction of the first phase between 2008 and 2010, also, the final phase is expected to be completed between 2015 and 2018. Once it is completed, it is expected to be the biggest theme park in the work and would be twice the size of Walt Disney Resort in Florida. 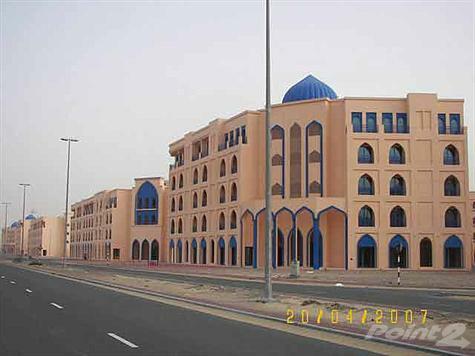 This project was started by Dubai’s Ruler, Sheik Mohammed bin Rashid al Maktoum, on 23 October 2003. This freehold property owns several developments which are spread over different regions within this community. This project will fulfil the taste of opulent villas to outstanding apartments to extremely well facilitated sports complex. Apart from the residential properties there are several retail outlets and purpose-built shopping malls are also being built. In addition it would include theme parks on globally known venues which include Paramount Studios, Universal Studios and Six Flags. Dubailand has immensely contributed to the booming freehold real estate Dubai sector. Facts and Figures • This project is estimated to bear a cost of AED 235 billion, for its establishment. • The Dubailand is spread over an area of 3 billion square feet and has seven themes which include culture and art, theme parks, sports and sports academies, science and planetariums, health and well being, resorts and hotels and retail and shopping. There are a total of 45 mega projects. • This Dubai property expects to have 40,000 visitors in a day which will increase to a toll of 15 million visitors a day by 2015. • Dubailand includes properties being developed by GCC national, UAE nationals and international visitors. • This project would comprise of 55 hotels set geographically. • Once fully operational, 2.5 million, population is estimated in Dubailand, which would include, workers, residents and tourists. The Worlds – Dubailand Dubailand is thronging with projects being developed all over the property. This entire property has been divided into 6 themes and each theme is referred to as the world. 1. Attractions and Experience World: This world caters to be at leisure with family and friends. This is a theme park which is comprised of adventure, roller coasters and water parks. These large scale attractions are catered for with the help of latest technology for safety and thrills. Theme parks have been inspired from some of the best in the world and aims to attract a huge number of visitors. This World would cover an area of 145 million square feet and has AED 6.8 million contributed in this. This also includes 14 projects which are Giant World, Global Village, Film World, Tourism Park, Space Hotel, Arabian Theme Park and several more. 2. Sports and Outdoor World: This world would inject high energy in sports like cricket, rugby and several other sports tournament. With a mix of sporting venues, this world aims to the prime destination for training facilities for some of the most professional sports team and encourage a huge variety of sport events held here. This world is spread over an area of 206 million square feet and has AED 2.5 billion invested in it. In addition there are 5 projects in this world which include Racing World, Dubai Sports City, Polo World, Extreme Sports World, etc. 3. Eco-Tourism World: This world depicts the natural beauty and comprises of desert based and nature attractions. Its unique and cultural aspects would appeal to several visitors. This world captures the beauty of nature to its audience an exotic appeal. Eco-Tourism World covers 806 million square feet and AED 4.2 billion is invested in this. There are a total of 12 projects commenced in this world which include Light and Sound World, Animal World, Sand Dune Hotel and several others. 4. Retail and Entertainment World: In Dubai shopping is one of the most attractive leisure activity with its “tax free” structure. This this world offers world class shopping at one of the largest mall – The Arabia Mall. This does not only offer extravagant shopping with some of the globally renowned brands, but also, has several entertainment and food outlets to complement it. This world covers an area of 46 million square and AED 2.4 is invested in this. This world consists of 5 projects which include World Trade Park, Auction World, Factory Outlets and etc. 5. Themed Leisure and Vacation World: This world offers a perfect vacation comprising of wellness retreat with spa, village residence and resort hotels. This is based on the concept of offering unique concepts of well-being which include stress management and fitness. This world consists of 311 million square feet of area and AED 3.6 billion is invested in this. A total of 4 projects are involved in this world which are Women’s World, Holiday World, Holiday World and Andalusian Resort and Spa. 6. Downtown: This world comprises of entertainment facilities which caters to all generations. This is a mixture of dining facilities combined with retail outlets and includes leisure activities like bowling, nightclub, themed restaurants, cinemas and street entertainment. This world includes an area of 6 million square feet and involves an investment of AED 2.4 billion. In addition there are 4 projects involves which are Dubai Walk, The Towers, Teen World and Virtual Games World. Dubailand is perfectly situated on the Emirates Ring Road which will offer easy access from Dubai, Sharjah, Abu Dhabi, Al Ain. It is ideally located 20 minutes from Sharjah, 10 minutes from Dubai Airport and 60 minutes from Abu Dhabi. Dubai has now started turning into a global business center and people have started investing in there as well. As we know that the Dubai property market is constantly rising and thus, many corporate multinational organizations have started setting up their businesses and organizations in Dubai. Just like the residential property in Dubai, the commercial property is also rising and they are planning to fulfill the requirements and demands of every person staying there. Many well known commercial properties are under construction in Dubai. Business Bay in Dubai is one such business district which is under construction and will soon turn into a global business hub. Business bay is a central business district. It is a kind of a new city which is being developed within the city of Dubai. This business district is located in Dubai’s downtown. It is not only a commercial but a residential district as well and is comparable to Ginza which is in Tokyo and Manhattan in New York. Business bay scores 100 percent on location as it is very closely located to the International Financial center in Dubai and is even close to Dubai International Airport. This project covers the large area of around 64 million square feet and it includes both office and residential units. Moreover, this is an ideal business place for people staying in Burj Dubai, Deira and other adjacent areas. It marks a convenient place even for those who are planning to shift their businesses near to it or in business bay itself. This business hub provides the best of business as well as residential facilities along with stunning views and sheer size and capacity for corporate head offices. This mixed-use development will soon be completely functional and operational and it is expected to get completed by the year 2010. Due to this extensive range of corporate facilities many regional and multinational firms will be well established here. Business bay is a very big project that consists of numerous skyscraper buildings. It has 230 more buildings which attracts many commercial and residential developments. As far as property developers are concerned, various towers and buildings in Business Bay are being constructed by some of the top most property developers in Dubai. The Dubai property market is witnessing a phenomenal growth and innovative projects which have been never seen before. The complete project is created by His Highness Sheikh Mohammed bin Rashid Al Maktoum and is still under construction. This project once fully constructed will be very beneficial to the people in Dubai and those coming from overseas for business reasons. Although, there are many commercial properties there in nearby locations such as Dubai Financial center, Dubai media city however, they all have some limitations in it as they are just open for very few specific business activities. On the contrary business bay is likely to be the hub for every industry which is operational. If we talk about the current pricing of the business bay, it is said that the prices of this central business district will cross Dh. 5000 per square foot. This report has been predicted by an industry expert. Moreover, this is a free trade zone that provides a better infrastructure and a better environment for corporate to function. Some of the towers and buildings inside Business bay are being developed by Dubai properties. Apart from this the majority of buildings are being constructed by a number of independent and local developers. The most well known and importantly constructed buildings at the bay are: • Burj Al Najoom • Chrchill Tower • Executive Tower D, E, J and M • Bayswater • One Business Bay • Lotus • XL Tower As far as the towers in business bay are concerned, there are a total of 46 towers including: The Bay Gate, The Forum, XL Tower, Al Manara, Crystal Tower, Burj Al Alam, The Prism, Iris Bay, Sky Tower 1, The Exchange, One Business bay and there are many more. The design and other hi tech modern amenities will take these towers a long way in terms of popularity. It is just a new extension of the famous Dubai creek that extends from Ras Al Khor to Sheikh Zayed road. Let’s talk about few important constructions in detail: Churchill Tower: This is a complex consisting of two towers and is located within the business bay. Out of the two towers, a tower named Churchill residency is the taller and as the name suggests it is a residential tower consisting of 59 floors. Other tower named Churchill executive is an office tower. This tower has 43 floors in it. The construction of these towers got started in 2006 and is expected to be completed in 2010. Moreover, the Churchill tower is being developed by Emirates national Investment. Executive Towers: There are 12 towers under Executive towers which are currently getting constructed in Business bay. Out of these 12 towers, 10 towers are residential ones, 1 is a hotel tower and the remaining 1 is a commercial tower. The commercial tower is known as the Aspect tower and the Executive hotel tower is the hotel one. These two are the first buildings which got completed and are just located near the entrance of business bay. All these towers are connected with each other with the help of a three-storey podium and it also connects the closely located Vision Tower. This is a three level podium and on the first two levels they have a Bay Avenue shopping mall and water front terraces. So, here is the description of few very famous towers in Business Bay however; most of them are under construction at this point in time. Similarly, there is another well known tower known as the XL Tower which is expected to get completed in the year 2008. Thus business bay will set up new and unique standards for the next business generation not only for Dubai but for even for the rest of the world. The thriving hub of economic growth – Dubai has people migrating from all over the world to experience the opulent lifestyle offered by this Emirate. This spectacular city stretches along the Persian Gulf on the Arabian Peninsula. The favourable political and economical stature has made Dubai an ideal destination to live. Being an Islamic country and having deep rooted traditions, this emirate has welcomed immigrants from all over the globe with open arms. The Dubai property sector has contributed immensely in its economic growth. The properties developed here have created world records. Investment in Dubai property has been the most lucrative because of high returns and are in great demand. With the ‘No Tax’ environment and the introduction of Freehold Law, the real estate sector of the emirate has been given a tremendous boost. Nakheel and Emaar are the two top property developers who have created strategic architecture, which has led to the boom in the real estate sector in Dubai. Talking about Nakheel, it developed one of the most outstanding properties in 2001 – The Palm. Palm, Jumeirah, Jebel Ali and Deira have one of the most magnificent architectural creation which has attracted large number of international residents, leading to huge foreign investment. This spectacular developer was established in 1990 and has recorded a profit of $770.5 million in the first half of 2008. Nakheel is also involved in developing several freehold properties on a huge scales and it involves luxury developments, retail spaces and several others. Yet another development by this spectacular corporation is the International City – Dubai. This is exclusively designed with themes which have been inspired by uniquely designed Middle East traditional carpets. This property has tourist attractions, residence and office properties and has been developed generously covering 8 million square metres of land. Interestingly, International City can accommodate about sixty thousand people and it contains one and two apartment units and studios. This property is located between interchange 5 and 6 Emirates Road, along the Dubai-Hatta road and in Al Warsan Region in Dubai. The property enjoys the benefit of being located just 5.4 miles from the Dubai International Airport, which takes about 15-20 minutes drive from the city. Also, this property consists of cosmopolitan residents from all over the world and features China, Russia, Italy, France, England, Morroco, Spain, Persia and Greece, Regions. The Central District: This 2,40,000 square metre district is ideally situated centrally in the International City. It is considered to be the hub of commercial base which includes leisure amenities and residential properties. The Central District consisted of 34 plots which have been sold to independent developers or private investors who have developed their projects, working under guidelines laid by Nakheel. This property would provide home to corporate offices, retailers and wholesalers. Dragon Mart Complex: Outside China mainland, Dragon Mart Complex is considered to the largest trading centre for Chinese products. This property offers great entertainment and shopping facilities. More than 3000 Chinese companies have made this place a permanent base for exhibitions and commercial trading. It features fully equipped eight, warehouses and array of retail products catering to both consumers and wholesalers. In additional, this magnificent place offers food courts, business centre, parking space for 2000 vehicles, Banks and ATM machines and post office. This shopping mall is beautifully constructed in the shape of a Dragon and spreads across 50 hectares. Residential District: This district represents various architectural style representing regions from all over the world, which include China, Russia, Italy, France, England, Morroco, Spain, Thailand, Indonesia, Persia and Greece. There are 413 buildings comprised of 5254 retail units and 23,847 studios and apartments. This property can accommodate approximately 60,000 people. Lake District: This comprises of 34 building with 1375 apartments. This spectacular property has been built around the Al Warsan Lake. This 25 hectare lake is the home for 300 most exotic birds and boasts about some of the most colourful flora and fauna in the world. Each building can be distinguished from the other on the basis of architecture, colour and its height. The mid-rise buildings are made of 7-12 storeys comprising of one to two bedroom apartments. Forbidden City: This is a replica of Iconic Forbidden city in China, covering 240,000square metres. This property hosts several entertainment facilities which include, a 5 star hotel, retail and food outlets, Chinese themed shows and exhibitions are organised here. In addition Forbidden City offers residential option with several studios and one to two bedroom apartments. Dubai Design Centre: Also known as Dubai Gates, occupies the Internet City by three sides. This property is exclusively used for temporary and permanent exhibitions. To accommodate visitors as well as exhibitors this Dubai design Centre consists of two hotels with three to four hundred rooms each. Properties have competitive prices as compared to open market value. Located in close proximity to Dubailand and other tourist attractions in Dubai City. Tax free status of Dubai. Offers large international exhibition market, for instance in Dragonmart displaying exclusive Chinese products. The real estate opportunities in Dubai are getting maximized and so are your return on investments. This emirate is facing real estate boom and if we compare this with other European realty markets, the property curve in property markets in other countries have started declining however, if we look at the Gulf States, the property market here is not only alive but it has been placed on a positive benchmark. The statistics of Dubai property shows that there has been 15 to 20 percent price rise in most of the popular emirates in the UAE including Dubai, Ajman, and Abu Dhabi etc. Moreover, if you look at this property market growth in Gulf States especially, in Dubai then you will find that there are certain reasons due to which we are noticing this high property boom here. The first and the foremost reason for this boom are high oil prices. The oil prices in the UAE have risen in past few years and now they have stand at very high historic levels. Even in the mortgage market higher interest rates have also increased the monthly borrowing costs. Moreover, this emirate is one of the latest in luxurious properties and is well known for its stupendous buildings and great architecture. Moreover, Dubai offers extensive facilities and they try to develop properties at prime locations. Moreover, if you are searching some property investment options there, then you will find a lot of them as Dubai offers wide variety of apartments, studio apartments, townhouses and luxurious villas. All properties in Dubai are combined with ultra-modern facilities. This place offers a unique lifestyle and there are 15 property free zones in which the developers can construct freehold Dubai property. Furthermore, if we look at the rise in property development in Dubai, it has been tremendous due to certain factors. • This emirate has no tax on property related issues and on capital and income. • There are selective properties for which you get automatic residency visa. • Moreover, the quality of construction speaks in terms of its high standards. Dubai property market is quiet updated and it offers wide range of villas to suite everybody’s taste and of course they have been designed as per the budget needs of the customers. At this point in time the property market here is really high in demand for luxury villas. Moreover, with such diverse variety being available in the freehold property market, no wonder why people will not buy such luxurious villas. The villas here are embellished by great landscaped areas, perfectly manicured gardens and lovely views that cater to residents who have shown trust in this kind of property here in Dubai. These have now stroked the buyer’s interest as the residents feel that they are living in a hugely popular and a stylish concept. The excellent range of luxury villas is available including affordable springs, Signature and Garden villas in Palm Jumeirah and at other locations. Earlier when the freehold property market got opened for foreign nationals, there was a cluster of premium villas such as Emirates Hills, The Meadows and The Springs. These luxury villas in Dubai are popular because of the fact that they are offering premium and ultra-modern facilities. Some of the reasons that why these villas are so popular includes: • The luxury Dubai villa has all branded utilities and accessories. • The designing structure of villas here is amazingly unique and combined with both Arabian and Western architectural styles. • The pricing structure of these villas is quiet moderate in comparison to American, Asian and European standards. • Moreover, there are high standards of security involved. • The villas are surrounded by lush green manicured gardens, swimming pools and other recreational facilities. These are some of the facts which made Dubai villas popular among property investors and buyers. Let’s discuss some of the well known Dubai villas to get an overview of their popularity. Jumeirah Village: This is the place which has been dwelled in tranquility, harmony and comfort and you have endless possibilities here. Jumeirah village collectively has 2,000 spacious villas. These villas and townhouses here are built in classic Arabian architecture and it provides a real sense of community living style. They offer you a living space that offers a blend of comfort and convenience. The spacious villas here have a range of 1 to 4 bedrooms of different size and locations. Some of them also have balconies so that you can enjoy magnificent views from there. Moreover, this property type promise for that true world class living. Signature Villas: Another category that we have in villas is the Signature villas offering stunning beachfront residences. This freehold property is developed on the shores of The Palm Jumeirah in Dubai. They embody the best of Arabic and European architectural design and they offer a range of extensive facilities. Every property here in Signature villas have luxurious standards of living as it includes a private beach and a swimming pool and it ensures complete privacy and luxury which is required. Moreover, this Dubai villa offers: • They have variety of designs, styles and layouts for villas. • There are health and recreation clubs. • There is an exclusive Marina clubhouse. • The villas overlook superb ocean views and lot more Moreover, the value of these property types have tremendously increased by over 100 percent or even more than that because of the comfortable and luxurious lifestyle available here. Dubai is one of the seven emirates of the United Arab Emirates which is growing steadily in terms of real estate developments. This city is centrally located in the Middle East which makes it a convenient place for business meetings and leisure. Today, Dubai has become a dream destination of all property investors and developers and this sudden real estate boom will continue in future with more developers entering the UAE market. This surge in property market can be due to many reasons; however, the first one is that there is no legal fee and stamp duty involved in property transactions. Dubai enjoys a tax free environment and a tax free lifestyle and no taxation is involved in property dealings here. This makes the whole procedure of selling or buying real estate Dubai, easier and the paperwork is minimal. In addition to this, many multinational companies are showing a lot of interest in Dubai and they are moving and setting up their divisions here, due to which there is an upcoming demand of residential and commercial properties. Apart from this, Dubai allows freehold property ownership to foreigners, which allows them to own, rent out and sell their properties in Dubai. There are some real estate companies those who are offering habitation visas especially to those people who purchase properties from them. Thus, the real estate sector in Dubai is witnessing massive activity in the form of investments from various private and public organizations. One of the many reasons for Dubai getting famous for real estate is because of its amazing architectural designs and spectacular growth in great property developments. This is considered today, as a billion dollar investment. Dubai Properties: If we talk about real estate Dubai, it is recognized as one of the fastest growing cities in the world in terms of property and real estate developments. However, you will find all kinds of properties here, that suits everybody’s requirements and of course budget. As far as properties in Dubai are concerned, they come in different forms of luxury apartments, villas, offices, hotels and various other commercial property developments. So, if you are really interested in buying some property there, you have plenty of selections. Some of the most well known Dubai properties include: Palm Islands, Dubai Marina, Dubai Waterfront, Jumeirah lake Towers, Business Bay and many more. Now let’s talk about a very famous and luxurious property in Dubai, known as Dubai Waterfront. Dubai Waterfront: This Dubai property needs very little introduction as it’s another spectacular project from Nakheel properties. This property development is expected to become the world’s largest man made development. This billion dollar project is an accumulation of many canals and artificial islands. And it occupies the remaining Persian Gulf coastline of Dubai. Dubai Waterfront is being developed by Nakheel, who is one of the largest privately held real estate developer. The portfolio of this well known property developer includes some other high value projects such as Palm Islands, The Gardens, Jumeirah lake towers, Discovery Gardens, Lost City, Jumeirah Islands, Jumeirah Village and the list is endless. However, if we talk about Dubai Waterfront, this property encompasses an area of about 1.4 billion square feet of water and land developments. Moreover, this project is closely located to Dubai World Central International Airport. Unlike other properties, this property construction is much more than a simple addition to Dubai’s property market. It is being situated on the western shoreline of Dubai and the location comprises of unparalleled transportation links and facilities. Moreover, the place has a number of major tourist attractions and other leisure facilities so that people get more interested in buying Dubai waterfront properties. It also features extensive range of luxurious villas and high end accommodation. This property project is being undertaken on a massive scale and thus it is set to create home for residential and commercial freehold properties. This project also suffice Dubai trade, as it will provide a harbor for boats and is a combination of various other sub developments including hotels, resorts, office and residential properties. If we talk about residential properties here, then this project is expected to be called home for about 1.5 million people. This is going to be the premier luxury housing region for both apartments and villas. Once the project is completed, it will extend Dubai’s coastline by 12 times as its current standing. Moreover, the focal point of the complete development of this project is the shoreline area Madinat Al Arab. As far as the architectural design of this property is concerned, it’s unique and it’s no doubt about the fact that this project will soon become one of the hotspot destinations in the world. This project presents Zero Five Zero freehold apartments. These apartments include one, two, three and four luxurious waterfront bedroom apartments and are located at one of the most strategically advantageous locations in the UAE. Above all, this property is so well designed, that it minimizes the ecological impact which can be seen in every minute detail of the property construction design. Resource efficiency and economic prosperity are the basic foundations on which this Waterfront property has been designed. There are specially designed utility centers that are dedicated to meet water and energy conservation which is very essential. Summary: If today, we will look at the property then you will notice that it is still under construction with many cranes and other heavy machinery, but once the project is completed it will turn into a self contained and self sufficient community that is probably larger than Manhattan and will be capable of housing about 1 million people. Ten to twelve years ago who would have wondered that in such a short span of time Dubai could become a world class city in the middle of the desert. But the fact of the matter is that Dubai is the crown of the desert today. Not only has it become a world class city but is easily the greenest desert city in the world. The real estate sector of Dubai deserves credit for the massive amount of green design developers have implemented in their projects in the desert city. The property Dubai market are not only equipped with the latest technology and luxurious lifestyle but almost every building has a patch of lush green grass or a garden for that matter to give it a serene and peaceful surrounding. Almost all buildings have been created with sustainable design be it a residential property or a commercial one. Environment friendly materials have been used to build the major constructions and the Land Department and the Real Estate Regulatory Authority is making sure that the best eco friendly practices are adhered to. His Highness Sheikh Mohammed bin Rashid Al Maktoum who is the vice president and prime minister of the UAE and the ruler of Dubai has passed a new resolution for the setting up green building specifications for the desert city. According to it the owners of all the residential and commercial towers and properties will have to fulfil the international environment friendly conditions. The law became effective in the January of this year and is definitely a major step towards a greener and better Dubai. This resolution will help in converting Dubai into a healthy city which will attract much more foreign investment and off course residents from all over the world. Dubai has set the benchmark in real estate developments and it is about time it did the same for environment friendly projects. The city is set to become pollution free and will further boost the image of the city as a great destination to have your future house. Mohammed Abdullah Al Gergawi, chairman of The Executive Office believes “The resolution will boost Dubai’s continuous efforts to promote global endeavours to face environmental challenges”. On the implementation of this clause is, Dubai became the first city in the Middle East to take up green building specifications. The city is certainly creating a path for others to follow. His Highness Sheikh Mohammed has always been very keenly interested in being part of the global environmental challenges that the world is facing. The Dubai Strategic Plan of 2015 passed by him aims at creating a city which not only is healthy but also the best in the world to live in. This certainly calls for the so called beautification of the city through green design. Green design has not only created environment friendly living conditions but also has called for a massive cut in electricity and water bills through innovative use of the same and in some cases even recycling the wasted energy for property Dubai. All these tactics will finally help in reducing the operational costs of the buildings and hence greatly enhance the capacity of developers to create efficient houses in the long run. A great example of Green Design being implemented on ground is in the Dubai World Central which is set to become a city within the city itself. It provides for global standards for a completely eco friendly urban design style. It covers an area of nearly 140 sq. km. built around the biggest airport of the world and will bring together the best practices from all over the globe in terms of environmental impact, social cohesion and spectacular architecture. The financial and commercial hub of Dubai World Central, Commercial City will have about 850 towers and will be catering to offices for more than 130000 people all set in green and healthy surroundings. The idea behind building a green city is to create a self sustainable environment with dynamic communities of people from all over the world that will resist the impact of the global warming and climate change that is threatening the world. 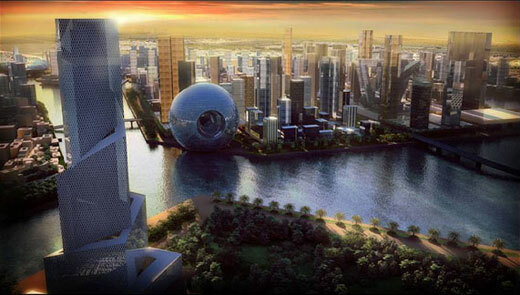 Dubai is all set to become the first global urban village with self sustaining capacities. But all this will only be possible if more and more environment friendly measures are taken and the government keeps up its active participation in the cause of nature. Many famous people have endorsed green design and are actively working towards creating such projects. One of the most famous Hollywood celebrities Brad Pitt is all set to design his very own eco friendly hotel in Dubai. Pitt who has a keen interest in architecture will put his knowledge to use and create one of the best resorts in the desert city. Dubai’s fast growing real estate sector hasn’t shown any signs of slowing down even when there are signals of a global recession. In such a scenario it becomes very important that the market stays competitive with other thriving markets and has the upper hand when everybody cries foul upon the mere mention of processes that could harm the environment. Thus a greener and healthier Dubai is the need of the hour. With such spectacular properties, owning a house in Dubai is a dream for everyone. Unmatched luxury with splendid serenity is all one needs to live a flamboyant lifestyle. Today, despite the recession in global financial market, Dubai real sector is booming. Let’s talk about the hands and mind behind these fabulous properties, which are beyond imagination of a common person. Nakheel developers are partially owned by the Dubai Government and are freehold property developer. Nakheel introduced its largest real estate project, the multi-million dollar Dubai waterfront. Dubai Water Front is constructed on the last undeveloped natural coastline extending to the border of Abu Dhabi and it is a themed residential commercial and tourist development property. In addition to this, Nakheel has several other fascinating projects on its cards including The Palm, which consists of three largest man-made islands built along the coastline of Dubai Emirate. It also features, The World, Palm Jumeriah, Palm Jabel Ali, Palm Deira and several other real estate Dubai. DAMAC properties is a part of DAMAC Group and is a leading freehold property Dubai company. DAMAC properties was established in 2002 with an intention to create residential, commercial and leisure properties. This company has expanded rapidly to several other countries. Palm Terrace, is one of their magnificent creation. It is constructed along the Oceanside of the trunk of Palm Jumeirah. There are several other projects involved with this developer such as Lake Terrace (Jumeriah Lake Towers), Marina Terrance (Dubai Marina), The Waves (Dubai Marina) and several more. Emaar properties is owned by the Dubai Government, partially and was the first freehold property developer in Dubai. Emaar properties is the provider of premier lifestyle and is one of the world’s largest real estate company in Dubai. The company was established in 1997 and since then, they have been creating outstanding landscapes. One of the most prestigious project for Emaar is the Burj Dubai. It is set to the tallest building, creating a world record for its height, located in the most sought after location, Downtown Dubai. In addition to this unique building, it has Dubai Marina, Arabian Ranches, Emirates Living, The Springs, Emirate Hills. Previously known as Estithmaar Realty, Dubai Properties is owned by Dubai Government and is a member of Dubai Holding. One of its major project is Business Bay. It is a freezone business, commercial and residential district that will extend along new Dubai Creek, all the way to the Dubai Coast. This property is build to retain Dubai as the region’s business hub. In addition to this, Dubai Properties have Jumerieh Beach Residence. This consists to four hotel towers and 36 luxury residential complexes. Apart from these, they have Vision Tower, The Executive Towers, The Villa, Business Bay Hotel, etc. Tameer Properties was created in partnership between Tammer Real Estate Establishment and Al Rajhi Investment Group in Saudi Arabia. It is the first and only property Dubai company, to be listed in Bahrain Stock Exchange. Known as Al Khaleej Development Company also, it is a popular real estate developer which facilitates, real estate investment, project management, property management, and related advisory services. One its project, The Princess Tower, also known as Dubai Marina is one of the freehold towers being built at the Dubai Marina. This tower is claimed to be the world’s tallest residential building with a total of 100 floors. In addition, it also has Elite Residence, Al Aalmeera Village, Al Salam City, Emirates Modern and several more. Established in 2005, by Ras Al Khaimah Government’s Investment and Development Office, it is listed on the Abu Dhabi Securities Market (ADSM). This Public Joint Stock Company (PJSC). In 2008, the company was expected to launch six projects in UAE to expand its portfolio. One its flagship project, Julfar Towers is a commercial and residential freehold property which is constructed four km north of Ras Al Khaimah’s city center. This outstanding development will have two 40 storey towers, one for residential use and the other is the office tower. Another spectacular project is the Mina Al Arab which is developed to cater to holiday beach resort and leisure. Other projects they have are Mangrove Island and Khor Qurm. Formed in 2004, ETA Star Properties is a leading freehold real estate developer and is a member of the Dubai-based ETA ASCON Group. This company focuses on developing residential and commercial towers. ETA Star properties have high quality, unique work with world class luxury. With robust backing this company deals with conceptualizing, designing, construction and property management. 23 Marina, one of its spectacular project is being constructed in Dubai Marina. It is the one of the many freehold residential tower at that place. This is 90 storey building with a 6-storey lobby entrance hall and an 8-storey covered car parking. ETA Star has several other projects in its portfolio including, Gold Crest Views 2 (Jumeirah Lake Towers), The Belvedere (Dubai Marina) and several others. Oryx Apartments It is the real estate development division of Dubai-based Oryx Real Estate. Oryx Corporation has explicit reputation in the local real estate Dubai market. It has a portfolio to develop luxury properties and offer investors and buyers unmatched service. Talking about their projects, The Altantic is being developed as a freehold residential tower at the Dubai Marina. It comprises of 18 storey apartment building with opulent amenities. Their second project is The Pacific, one of the many freehold property being built in Dubai Marina. It is an is a 27-storey freehold apartment building. Dubai has been a significant player in the global economy and has been the pioneer of growth of the United Arab Emirates. Dubai and the talented developers have continued to create several innovative projects, to make this destination as the most ideal for any anyone to live in luxury, work in perfect surroundings or just have a leisure trip here.